I love playing with the 'bead soup' in the Ben Franklin Crafts Bead Shoppe. It's sort of like digging for treasure in a glass bowl. You just never know what's in there until you search. A few days ago I noticed that the soup bowl had the metal-lined, big-hole beads that I find attractive. They were priced right ($1)....way cheaper than the Troll beads (the ones that started this trend and can cost $50 for just one bead!). Not being able to resist, I dug through the bowl and picked out a handful of mostly irridescent metal lined beads. 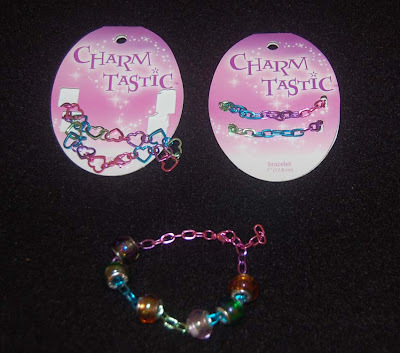 On the same day I purchased some colorful irridescent chain bracelets that I planned to use with a hardware clasp my sister sent me. Once at home, I realized that I could remove the end jump ring from the plain chain bracelet and string the beads on the chain and replace the jump ring to stop the beads from falling off. Wow, a bracelet made by just the opening and closing one jump ring! Because the bracelet was a bit too long I reattached the jump ring to the third link of the chain. Rather than cutting off the extra links, I decided to leave them so I can attach an appropriate charm (when I find one). Maybe I might add some charms between the beads, too. 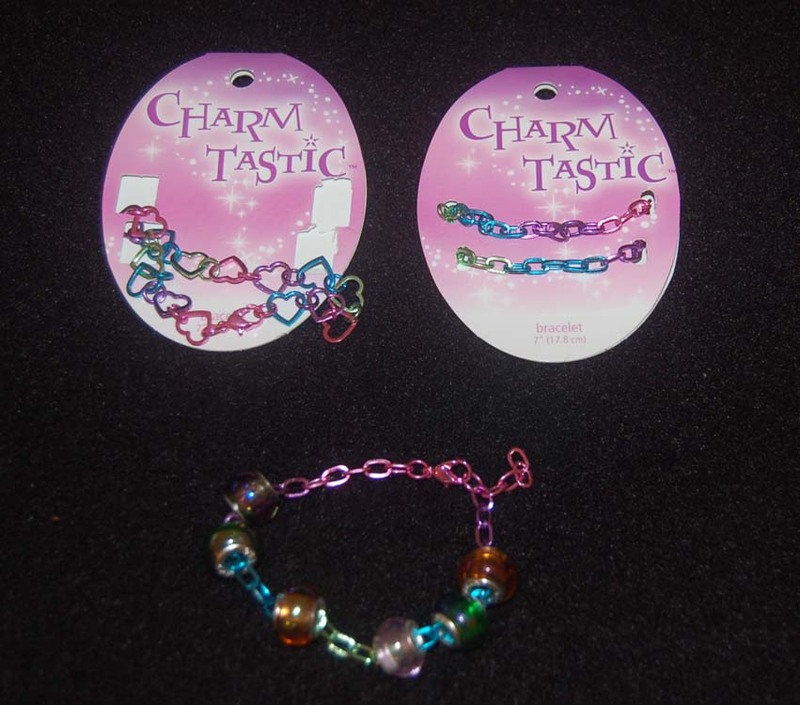 The colorful irridescent jump rings sold at Ben Franklin Crafts will be perfect for attaching them. Thank you for being a reader of my blog post. I hope you've enjoyed it and will leave a comment if you have the time. I enjoy your feedback. Here are two treasures I discovered on my recent trip. 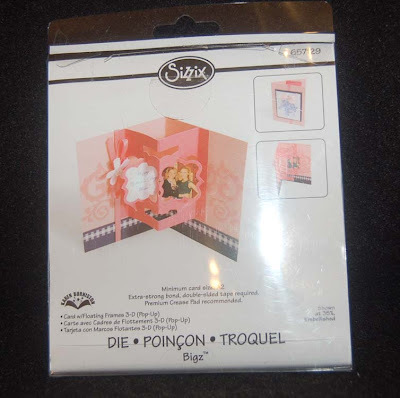 The box was purchased from a little boutique store in Bothell, Washington. 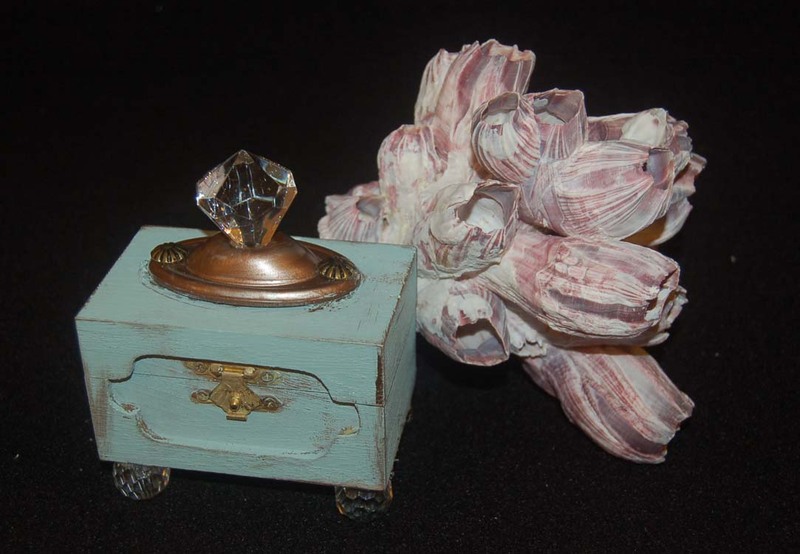 It was an inexpensive item which had a shabby chic look that was made simply using a hardware store drawer pull on top and large faceted plastic beads for feet. Isn't it adorable? I thought blogland crafters might find this an easy, clever project to make for craft fairs. Ben Franklin Crafts has a large inventory of wooden boxes which could easily be turned into a keepsake keeper like this. The barnacle in this photo was a real find from a store in Kahala Mall. (I've forgotten the name of the shop.) I plan to use this barnacle as an earring and bracelet holder/display on my dresser. I think that I will go to Ben Franklin Crafts to get other shells for a dining table display. Recently, the Nate Berkus show (0ne of my favorites) encouraged viewers to decorate with shells in a sand-filled tray. I like the look and I am further inspired everytime I go to my eye doctor's waiting room and admire the casual island feel a tray of shell imparts to a room. Shopping for treasures doesn't have to cost a fortune but the treasure should enhance your life and give you pleasure everytime you look at it. Objects can be 3-D memory holders for pleasant times.....hmm-m-m maybe I can insert a photo into the barnacle AND hang my jewelry on it. Keep your eyes open and you will be surprised at what you discover. Happy Hunting! Here's what I did with one of the Sierra Pacific $1 recycled paper faux leather notebooks. I was rushing to make a quickie hostess gift for an aunt. Because the SP notebook was on my desk, I grabbed it and began my 15 minute project. From my Asian paper scrap drawer, I found a 'too good to toss' Christmas card from my husband's friend in Japan. After cutting out the decorative panel, I noticed a fold which I wanted to hide so I searched through the drawer again. Luckily, I discovered just the right red printed paper with gold foil highlights. There was enough of the paper to cover the flaw in the panel and cover the pen as well. Voila! The recycled notebook decorated with recycled paper was done. Oh, the double happiness sticker was purchased from Ben Franklin Crafts (er, a few years ago....they still might have these in stock). Even my husband was impressed with the clever use of recycled material and perhaps now he can understand why I save every pretty wrapping paper, postcard, stamp, and greeting card that we receive. Well, maybe he still doesn't get it but he'll tolerate the mess. Okay dear, I'll clean up the craftroom...promise....reeeeally...heeheeeheee! 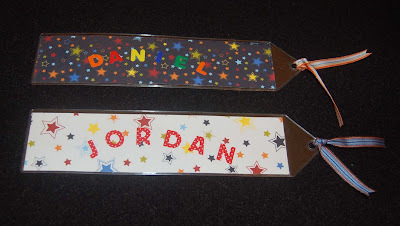 I was wrapping some books to give to two little boys and about to make some tags for the gifts when it occurred to me that I should make bookmark tags. 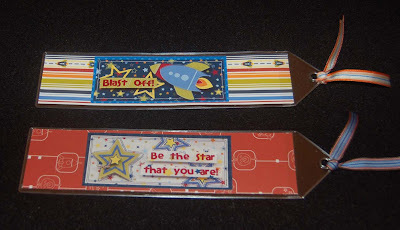 Since I had recently purchased the BoBunny line of alien/rocketship papers, stickers and embellishment, I was ready to make some boyish bookmarks. It literally took minutes to make the tags because the BoBunny products included just the right-sized stickers and I used letter stickers for the names. My husband always frowns when I add more ribbons to my collection, but I smile everytime I find just the right one from my stash. These ribbons were from American Crafts. The vinyl bookmarks can still be purchased from our online Ben Franklin Crafts Club store. I love giving books for gifts because I think reading is the key to success. Give a book and make a bookmark gift tag because then your handcrafted work won't be tossed into the trash with the wrapping paper. LOL! There is just something about the popcorn box shape that says, "Fill me with goodies"; so when I returned from my travels with a suitcase full of treats to share, I reached for the die I knew would produce a large container. This popcorn box #2 (I haven't seen the #1) requires two sheets of 12x12 cardstock. I prefer double sided cardstock because it looks prettier to see another color inside the box. The rosette decorations were leftovers from a previous posted project. Most of the other decorations were bits and pieces from my 'too good to throw away stash'. 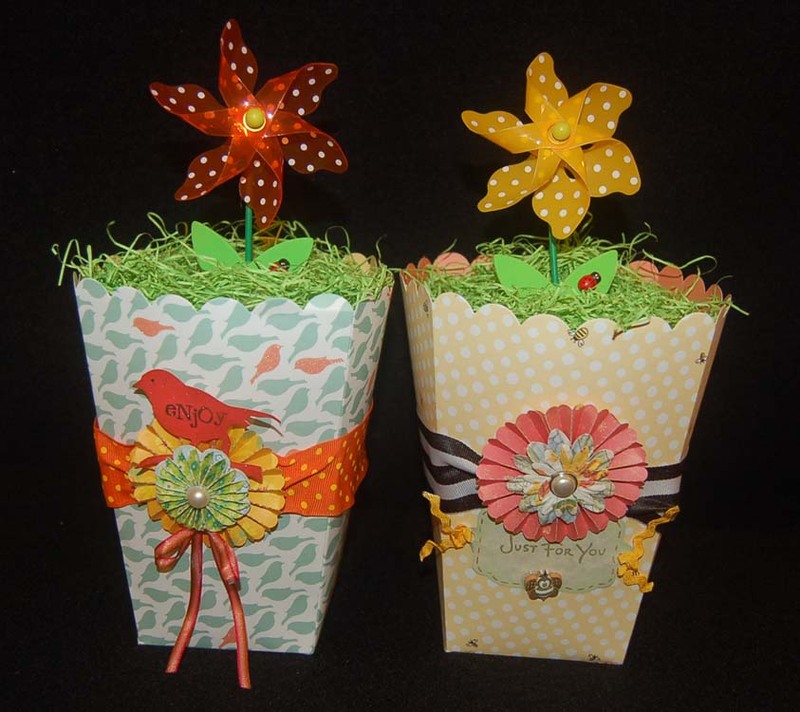 The potted pinwheels are available at Ben Franklin Crafts and come in a set of six for $5.99. Under the shredded paper grass are four cello bags of treats (about 2lbs. ), so you can see that this is a BIG container. After eating the contents, I'm going to suggest that the recipients use the boxes for desktop scrap or waste paper containers. Thank you for stopping by and reading this post. I hope that it has be informative and that you will return often to see what I've been thinking about and creating. Have a creative day! I just returned from a trip to the mainland and so I'm trying to catch up on blog reading. Sorry I haven't been commenting much. At the tail-end of the trip I stopped by the Mapunapuna Ben Franklin Crafts and found some interesting items. I checked out the Bead Shoppe first because I wanted to get some of the new Swarovski two holed crystals so I could make the ring shown on the Ideas and Inspiration site (see my sidebar). I was also able to get a free instruction sheet. While getting the crystals I spied some plumeria flower bracelets. From the photo you can see that they come in numerous color schemes and that they are gorgeous. I understand that lots of customers bought them to give to graduates instead of leis. I think they will make great gifts for those Hawaii girls who are away from their island home or friends planning to visit our state. 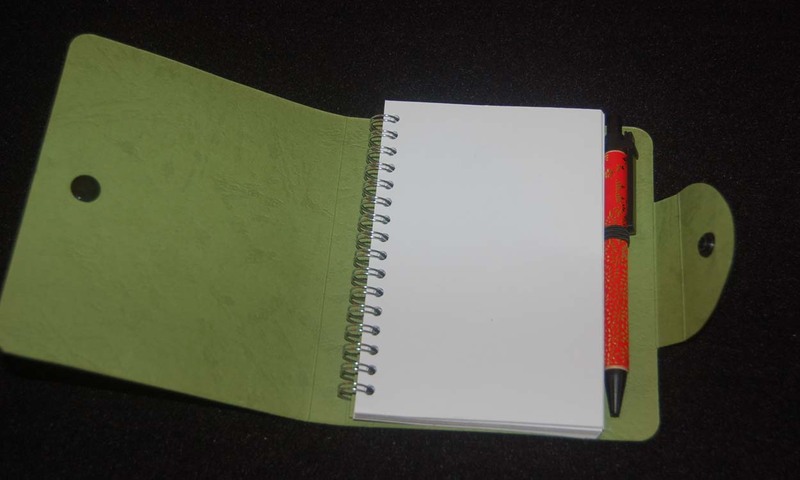 Other goodies that I couldn't resist are the faux leather notebooks with pens by Sierra Pacific (which come in some lovely colors). I couldn't believe that they cost only $1 !!!!! They are perfect to decorate and have on hand for a hostess gift or make dozens for favors. There were more Studio 112 products that I picked up, too. These embellishment stickers will be beautiful on the notebooks with pens by Studio 112 or Sierra Pacific. Finally, I just couldn't resist the Hello Kitty puffy dessert stickers. I don't know what I'll do with them yet, but they were just too cute to pass up. If you are a HK fan, you know what I mean. 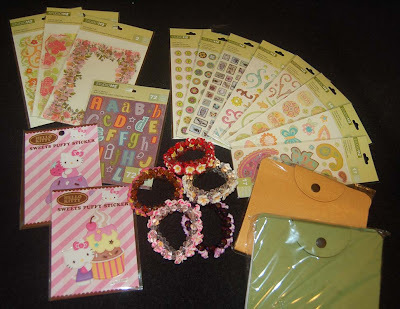 Luckily, BFC always has an ample supply of Sanrio items in stock. Well, thanks for reading this post. I promise to get working on new projects to show you what caught my eye while shopping during the trip. I love pop-up cards! Don't you? They are however, somewhat tedious to make so I have a great tip for you. 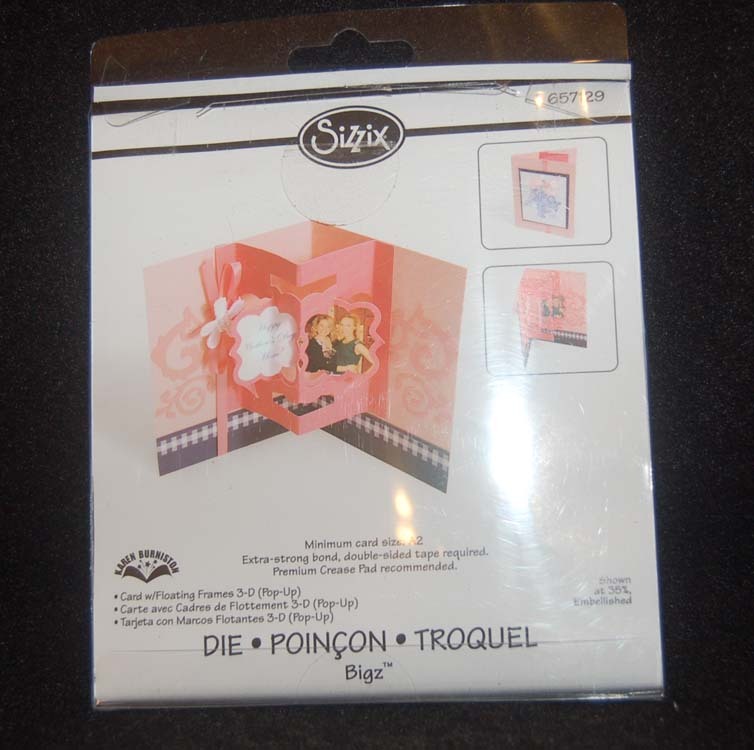 Get a Sizzix pop-up card die and you will soon be making dozens and dozens of cards....fast! 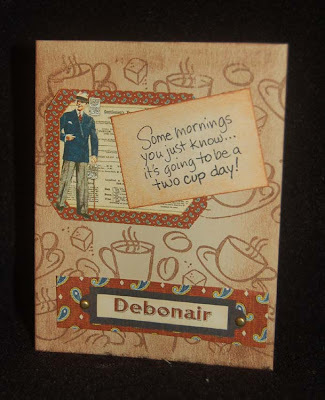 (See last photo for the die I used to make this card.) I also love cards with a sense of humor. This card is of course for my DH who has to be the world's best father. He is a businessman so you'd expect him to be dashing and well-groomed at all times....heeheehee! That's why the front of the card shows a rather elegant man setting off for a long, hard day of work. The inside of the card shows the reality of his life. The little monkey inside represents not one of our boys, but ME!....the monkey at home who's always up to something and is the kid who will never grow up! The clear stamps used on this card are from Stampendous except for the 'Happy Father's Day' one, which is a Dandelion Design stamp. I don't remember where I got it or who made the coffee cup stamp. The printed papers were from a package by Studio 45 and a thoughtful gift from Regina. Thanks again Regina! It's so hard to find paper designs for men. I'm hoping that one day we'll carry this line in Ben Franklin Crafts. With Father's Day only a couple of weeks away (June 19th), it's time to start making a special card for that super Dad. 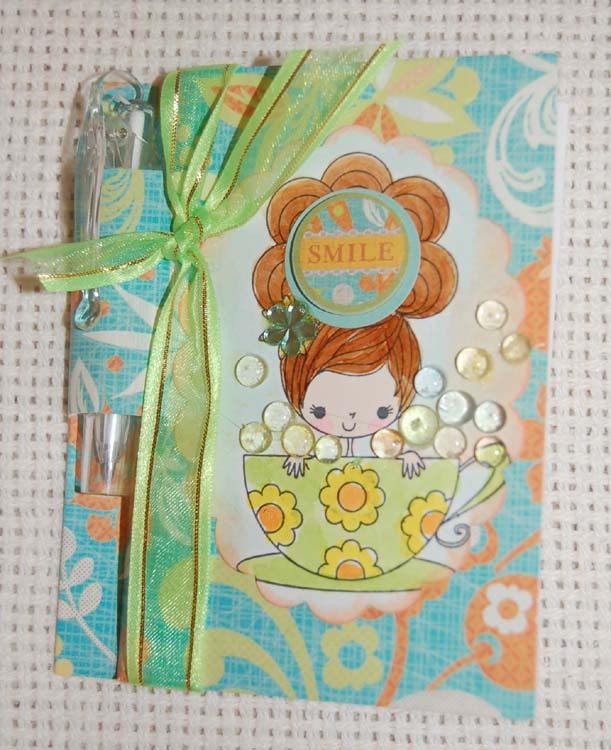 It's fun to make a card that coordinates with a gift......shhh! I got him a coffee maker.....don't tell. 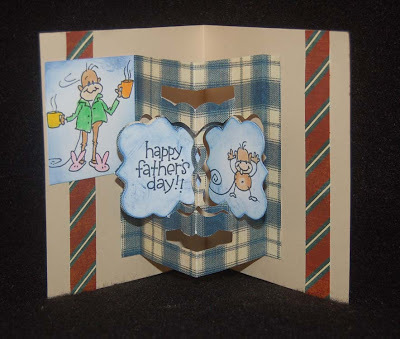 Wishing a Happy Father's Day to all the great DADS out there in blogland! Hey, have you seen the notepads with pens by Studio 112? There are several designs (but I just bought one style) and they retail for $1.25! Also in the same line (from EK Success and K and Co.) are stickers which match the note pads and they are $1.25 too! (See bottom photo.) 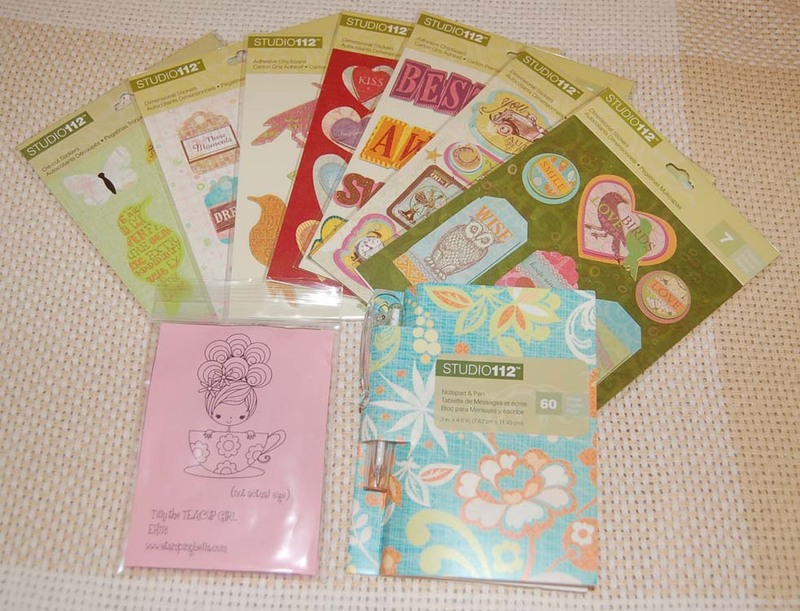 If you need some favors or mini-thank you gifts, these notepad booklets can be quickly decorated with the stickers (some are dimensional). I decided to fancy mine up even more by using a Stamping Bella image that I colored with Copic pens. I made this notepad for someone who loves tea and always seems to need a bubble bath to relax. I stuck one of the Studio 112 stickers on her high beehive hairdo in the hopes of minimizing it, LOL. I think the acrylic dots are the perfect touch to turn the tea cup into a bubble bath. Oh, the ribbon was on sale at BFC and there were lots of other colors too. 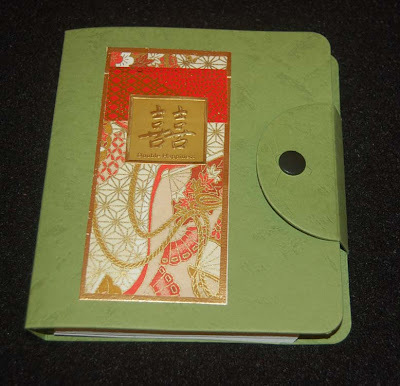 If you decide to embellish one of these Studio 112 notepads (they are attractive plain, too) be sure to keep the decoration as flat as possible otherwise they will come off in the heavy traffic of a purse's interior. You know what I mean .....right ladies? Okay, so hurry on down to Ben Franklin Crafts and get your Studio 112 goodies before they disappear! 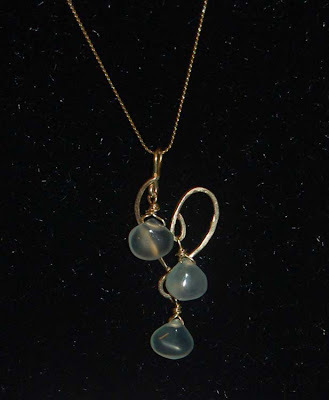 Last Christmas my sister gave me a lovely strand of sea glass green chalcedony top-drilled beads. I have finally made her a piece of jewelry using three of the gemstone beads. My sister and I have been separated by the Pacific Ocean for about 15 years with only a few visits in all those years, so I thought this pendant I designed for her will be a sentimental gift that will remind her of me. I hope she likes it and can see the symbolism of the open heart and ocean-colored tears. Maybe I will have to tell her the title of the piece. I used 18 gauge soft round gold-filled wire (about 6") and shaped the pendant with pliers/fingers. Using a jewelry hammer and anvil I flattened the wire making sure not to hammer where the wires crossed (causing too much stress). The teardrop beads were wired on with 24 gauge round HH gold-filled wire. All of the materials and tools for this piece are available at Ben Franklin Crafts except perhaps for the chalcedony teardrops from my sister. If you are interested in getting started in making wire-worked jewelry, a piece like this is a good place to begin. Brass or copper wire is probably more economical to practice with and there are some new plated and silver-filled wire which can be a good money-saving substitute for sterling silver. Well, thanks for reading this blog and perhaps it's given you an interest in wire-work jewelry making. Learn something new everyday and keep your mind young!